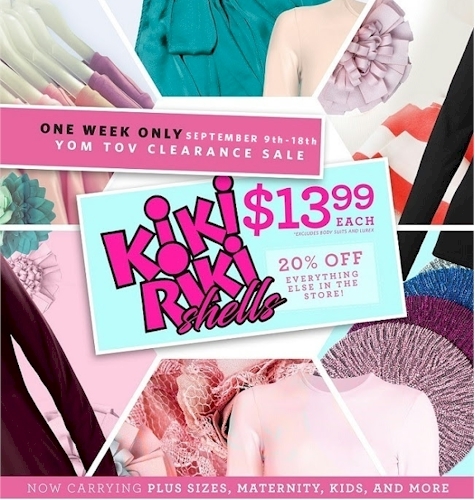 Shell Sheli is holding a Pre-Yom-Tov Clearance Sale with all Kiki Riki shells at $13.99 and 20% off everything else in the store (some exclusions, no promo code necessary). They stock misses, kids, maternity, and plus sizes in a wide variety of shell styles, materials and sleeve lengths. And when you join the Shell Sheli mailing list, they will give you a promo code for $5.00 off your $20 purchase, in addition to existing discounts (click on the pink "Get a Coupon" button on the right side of the site and enter your email address). Shipping is a flat $4.99 or FREE shipping for a $75 minimum purchase.